Demonstrate pathologies from common to not-so-common with this life-sized model. 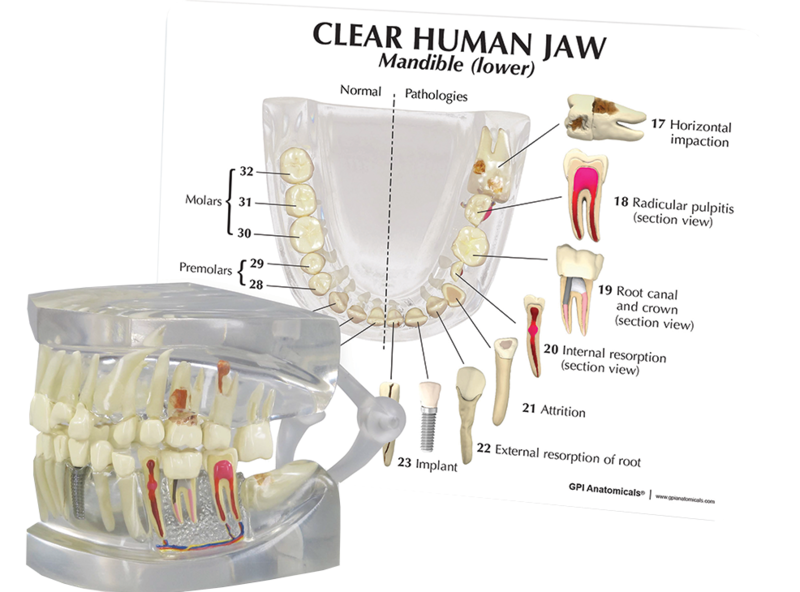 Clear jaw and gingiva let patients see what’s happening below the gum line. Hinged design has one healthy side and one side showing 16 issues such as root fracture, radicular pulpitis, impaction, internal resorption, periodontal disease and abscess, super eruption, fracture, erosion and abfraction. Also shows a root canal and crown and an implant. Includes two-sided plastic card labeling all the conditions. Model is 3 ½” x 2 ¾” x 2 ½”.